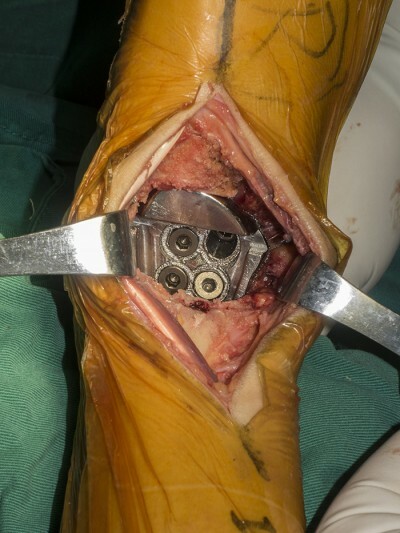 Purpose: Arthrodesis is one of the most widely accepted surgical recommended methods for tumors of the talus, but it may be associated with poor limb functions. The aim of this study was to present a novel reconstruction with ankle function preserved after en bloc talus tumor resection. Patient and method: A 43-year-old female with mesenchymal sarcoma of the talus was admitted in West China Hospital. Total talar replacement with three-dimensional (3D) printed modular prosthesis was prepared for reconstruction. The 3D printed modular prosthesis was designed exactly as the mirror image of the contralateral talus with complete filling of the sinus tarsi and subtalar joint space. The upper modular component of prosthesis was made of ultra high molecular weight polyethylene, and the lower component, titanium alloy. Pre-drilled holes in three directions were prepared for screw fixation of the subtalar joint. Results: The patient underwent en bloc talus resection through anterior approach, followed by reconstruction with the 3D printed prosthesis. The whole procedure took 2 hours, and intra-operative blood loss was 50 mL. At the last follow-up, our patient was disease free and she could walk almost normally without any aid or pain. The Musculoskeletal Tumor Society score was 26/30. The American Orthopedic Foot and Ankle Society score was 91/100. The range of motion for dorsiflexion and plantar flexion was 40°. And no abnormalities were observed in the roentgenograph. Conclusion: Total talar replacement with a 3D printed modular prosthesis may be an effective procedure for patients with tumors of the talus as it could maintain ankle function.